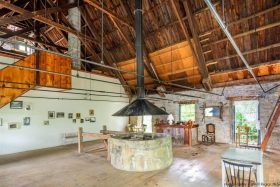 This unusual property has an enchanted background even before you see it: Situated in the Hudson Valley between the towns of New Paltz and Kingston, built into a stone ledge above the Wallkill River at the mouth of the Sturgeon Pool, this former church made of hand-cut stone dates from the 19th century. With an industrial past behind it, the 7,000 square-foot building is now used as a multi-level living and working space, with a three-story tower, balconies, an indoor fire pit and three bedrooms within, surrounded by lush gardens, water views and an outdoor grill. It’s also for sale, asking $799,000.